What are ventricular assist devices (VAD)? A ventricular assist device (VAD) is a mechanical pump that helps a weak heart pump blood adequately. Ventricular assist devices are implanted surgically and provide partial or total circulatory assistance to the natural heart. These devices may be referred to as mechanical assist devices, mechanical circulatory support (MCS), left ventricular assist devices (LVAD), or biventricular assist devices (Bi-VAD). Ventricular assist devices are different from artificial hearts, which are designed to completely take over cardiac function and require the removal of the patient's heart. About 40,000 people in the United States need a heart from a compatible donor, but only 2,200 donor hearts become available each year. Ventricular assist devices can keep patients alive during the wait for transplantation. The left ventricle is the large, muscular lower chamber of the heart that pumps blood to the body. A left ventricular assist device (LVAD) is an implantable mechanical pump that helps pump blood from the lower left chamber of your heart (the left ventricle) to the rest of your body. A biventricular assist device helps both ventricles (lower chambers) of the heart. It helps the right ventricle of the heart pump blood to the lungs and the left ventricle to pump blood to the body. Together, you and your doctor will decide the best type of device for your condition. Some pumps are placed inside the body; others have parts that fit inside and outside the body. Some ventricular assist devices are intended for short-term use, typically for patients recovering from a heart attack or heart surgery. Others are intended for long-term use, typically for patients who have congestive heart failure. 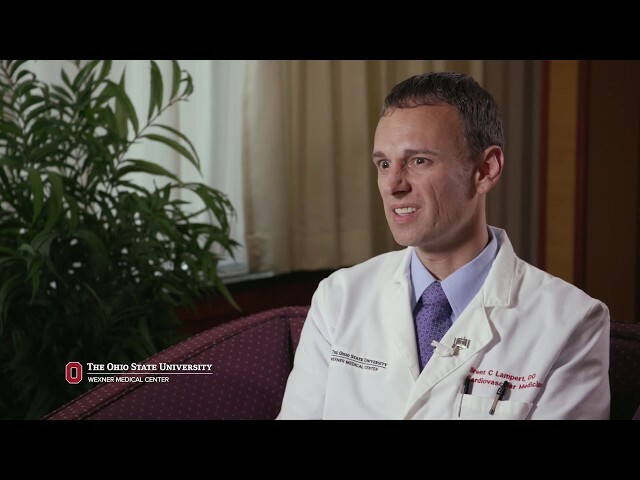 Why choose Ohio State for ventricular assist devices? The Ohio State Wexner University Medical Center has one of the largest and most successful cardiac mechanical support programs in the country, and our team is recognized worldwide for leadership in this field. Our physicians excel in treating patients with ventricular assist devices. We are one of the nation’s leading enrollers in a randomized multi-center trial testing the effectiveness of a second-generation ventricular assist device that is smaller, lighter and longer lasting than previous models. 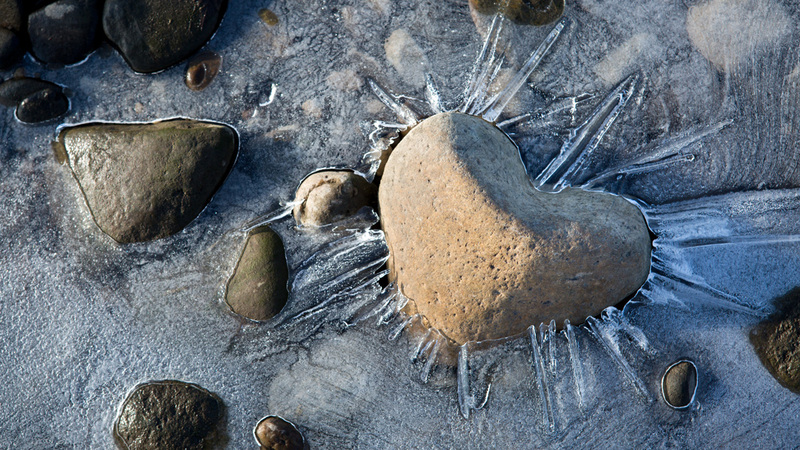 The device recently received Food and Drug Administration approval as a destination therapy for heart failure patients. We also were one of the largest enrollers in a trial studying the efficacy and safety of ventricular assist devices in the treatment of patients with advanced heart failure who were ineligible for transplantation. 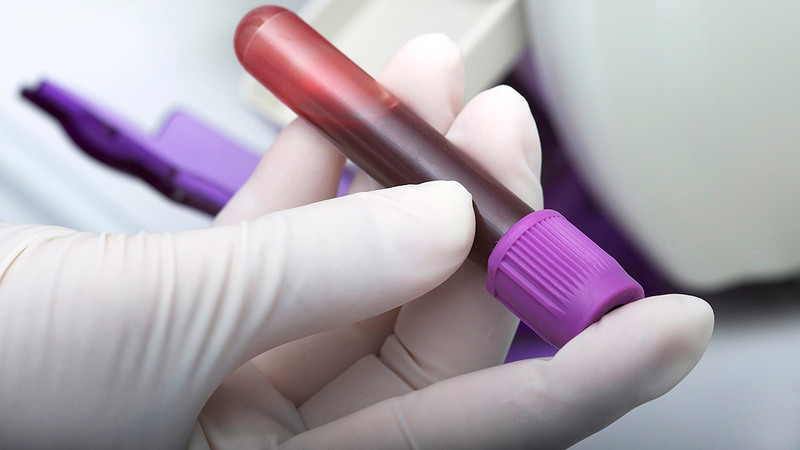 Results revealed two-year survival rates of 58 percent, almost double the survival of the best alternative currently available. These statistics are promising, but the true importance of the study is the continued dedication Ohio State demonstrates to seeking alternative approaches to cardiac function replacement. Ohio State is the fourth U.S. institution certified to implant the CardioWest temporary Total Artificial Heart® (TAH-t). Used as a bridge to transplant, the total artificial heart is the newest option for patients with severe, uncontrollable heart failure. Placement of the total artificial heart can help transform a poor transplant candidate into a better candidate for heart transplantation. Ohio State has the largest and longest running VAD program in Central Ohio. Our surgeons have developed a technique to perform the implant procedure “off pump,” without placing the patient on cardiopulmonary bypass, reducing transfusion requirements and shortening recovery time. Heart patients treated at Ohio State may have the option to stay at The Unverferth House. The Unverferth House is a temporary residence for Ohio State’s Richard M. Ross Heart Hospital patients and families who live outside Franklin County. The House provides a safe and comfortable environment to families and offers them a chance to share thoughts and emotions with others who may be experiencing a similar situation. The House also serves as convenient housing for patients just after discharge, when frequent visits back to Ohio State’s Ross Heart Hospital are required. Priority is given to families of patients receiving a heart transplant at the Ross Heart Hospital, but the House welcomes families of other patients as space allows. All guests must be referred to the Unverferth House by a Ross Heart Hospital social worker. Guests must live outside of Franklin County to stay at the House. Before your surgery, you’ll meet with your doctor to discuss your medical history, the medicines you take and any questions you have about the procedure. Most people who have this procedure are already in the hospital for heart failure. You are given general anesthesia and are asleep while your VAD is implanted. Some patients are on a heart-lung bypass machine while the pump is placed. Surgery usually lasts 4 to 6 hours. The sternum (chest bone) is opened to place the pump into the heart. The mechanical part of the pump is often placed in the abdomen with wires coming out of the skin to connect to a power source. The pump weighs 1 to 2 pounds. If you need it permanently, it is placed in your abdominal area. It may also be used outside of your body when you are waiting for a permanent pump or a heart transplant. The electronic controller is like a small computer that controls how the pump works. The two batteries, carried outside your body, are connected to the pump with a cable that goes into your abdomen. Typically, people who are put on a VAD receive intensive care up to five days after their surgery. You may be hospitalized anywhere from two to eight weeks after you have had the pump implanted. During this time, you learn how to care for the pump and you are given at-home care instructions. Bob Garner suffered with congestive heart failure for years. Heart failure doctors at the Ross Heart Hospital created a treatment path for Bob that involved advanced therapies, including a left ventricular assist device (LVAD) and, eventually, a heart transplant. 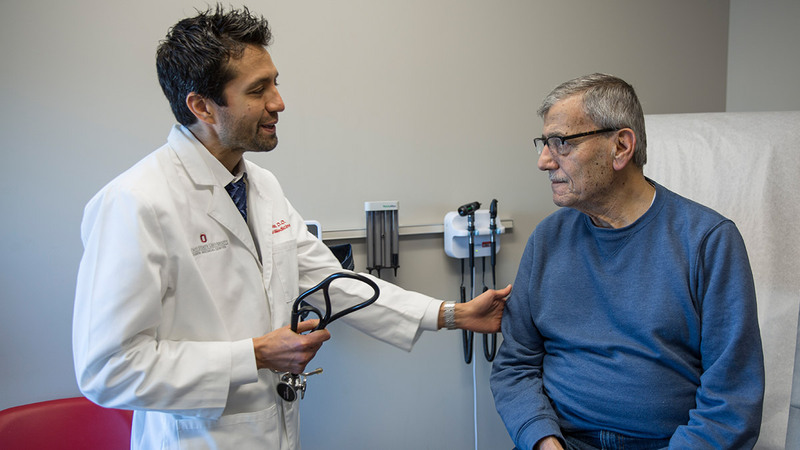 Brent Lampert, DO, an advanced heart failure specialist at The Ohio State University Wexner Medical Center’s Richard M. Ross Heart Hospital, explains how his team approached care for their patient Bob Garner, who was suffering from advanced heart failure.